but it just came out so tasty, I could not help myself. This is a dinner that was planned for another day. But with a head cold setting in, I needed something with spice and flavor, but not a lot of heat. 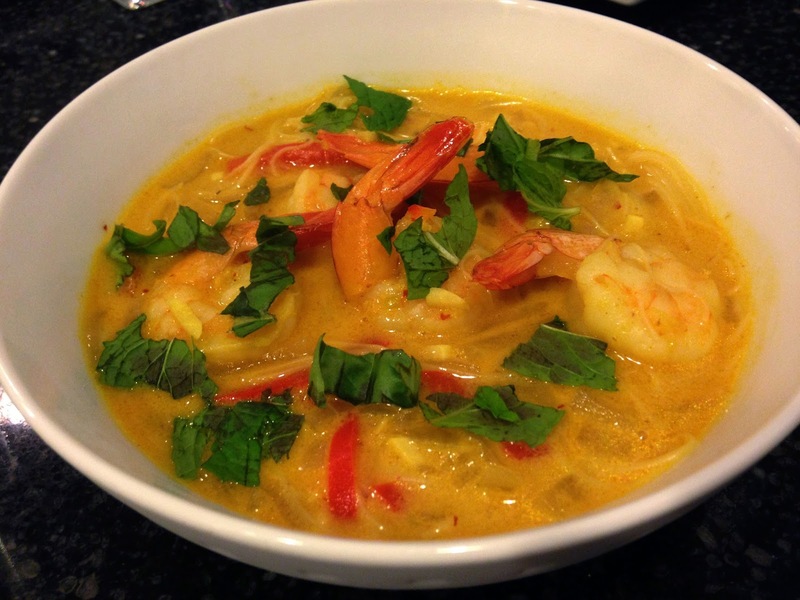 This soup, a Malaysian style dish, has plenty of aromatics in the lemongrass, garlic and ginger. There is turmeric, which adds flavor and gives it a lovely golden-orange color. And, one of my favorites is in here: red curry paste. There is so much going on here, yet it all works perfectly together. And perfectly with the base of broth and coconut milk. Thinly sliced onion and red pepper swirl around the bowl with light, thin rice noodles, and shrimp add some meatiness. To finish the soup, I wanted more fragrant goodies, so I topped it all with little tears of fresh mint and basil. The smartphone picture does not do justice to the beauty of the dish, but it was getting late. And I really just wanted to eat. But first, to give it a sniff. It was all there. Fragrant perfection. And the more I ate of it, the more my head cleared. At least for the moment. I can only that if it smelled and tasted this good with my impaired senses, it would really sing when things are firing on all cylinders. Heat canola oil in a large pot over medium-high heat. Add onion, garlic and lemongrass. Cook, stirring often, about 5 minutes or until the onion is soft, but not browned. Add the coconut milk, broth, fish sauce, red curry paste, honey, coriander, turmeric and ginger. Bring to a boil, then reduce heat to low and simmer for 10 minutes. Add red bell peppers and cook until softened, about 5 minutes. Use tongs to carefully remove lemongrass pieces, or, if you leave them in, be careful when serving to leave them out of the bowl. Add shrimp and rice noodles and continue to simmer about 3-4 minutes, until shrimp are cooked and noodles are soft. Serve immediately. Sprinkle with fresh mint and/or basil.